A lifetime ago, I waded through Malaysian government bureacracy and countless trips, meetings, and visits to work in a remote national park in the interior of Borneo. The process took weeks, and not every day of my time living with communities learning to farm on forest edges was smooth, or rewarding. Many days I slept shoulder to shoulder on the floors of forest huts before long days of planting. One night a wild boar ate my sandals. But I will always remember one day: I walked far upriver along a trail that to harvest fruit tree seedlings - we called them wildlings. Rather than going back the same way, our party split. Part of the party left to go hunting; the other part jumped in long boats to glide back downriver to the community. The boats were a bit full, and though of course my friends would have made room for me, I elected instead to mostly float alongside the boats, sometimes grabbing on to the low-slung carved out hardwood hulls, but most of the time just drifting. Along the way we beached one of the boats, with help of a group of women, and scrambled up the steep embankment and collected tapioca leaves and forest ferns for dinner. Back at camp, when we pulled up to the banks of the village, I realized that I was no longer afraid of river snakes that sometimes swam along side me, leeches, dengue. I had come to know them and lived. I was free, food secure, happy, without worry. This was so so different than my first years farming, here, digging in. I was often worried, scared, and not who I want to be. This morning, on NPR, I woke up to some new predictions of climate change. By mid-century we may easily see a two degrees rise in temperature and by the end of the century, we could see up to four degrees. That's almost catastrophic, and it's certainly detrimental agricultrual options worldwide. While some of the physics of this equation we can't stop, we can focus on the human solutions, building a food secure community that is strong, resilent, and embraces one another just like it embraces new farming practices. All new farms, including ours, place an emphasis on infrusturcture. We've been doing that these past years. But sometimes I feel that we all neglect our social infrusturcture. That's why we have The Eatership. For the past several years, we've been steadily growing the amount of food we subsidize for members of our community. We believe that that everyone, regardless of income or status or lifestyle, should be able to have access to organic, fresh, local produce for our entire growing season. Through farm donations, we raised $2200 last year to subsidize farm feedbags for seven farm members. We made the choice of who received membership assistance based on donations (our farm chipped in too) and our simple, self-reported, need based application. The majority of the Eatership applicants paid some share of their farm membership, so this money is just not an all out gift. We think of this as a partial scholarship. As we mature, we'd like to expand this program, and we see this as a program that could be scaled, to eventually include all farms in the Bitterroot that offer a farm membership program. We have two local not for profit organizations in mind that would be suitable partners to manage this program, we have a starter grant in mind that would help fund some of the administrative fees for the management that our greater community could run. Raising donations of $4000 this season can help prove to our community of supporters and businesses that this program is scaleable and deserves more capital - both the human capital to run it and the funds to help create a better world, with secure access. This is something that keeps me motivated to farm. It's something I think about every day, whether working on a tool tool, cultivating, seeding, working on our crop plan or encountering a snake in our gardens. Late one evening, in the forest of the Crocker Range, I was wandering the forest footpath back to the village after a community gathering. This was a forest island of fruit trees mixed with community lands, large trees and the surrounding park. Moonlight filtered down through the forest and clouds rolled up. Muffled laughter filtered down the hill from the church, through the forest, through the mist. Just years ago, a decade or two, men and women carried salt from the coastal areas to this community. Now, it’s flown in by helicopter when the bridges that span the rivers need to be repaired. To arrive under the moon, via logging road and the path that links the sea to the forest is to experience what this might be like -- years ago. Crossing a bridge under the moonlight with a loaded pack and a roaring river below is like reenacting the migration. In this forest, though, I heard bare feet pounding the forest path. The large canopy parts and moonlight and clouds pool. I set my camera back in the forest, well off the footpath and made a single exposure to illuminate the night forest and moonlight. In this same exposure, I managed to catch the the gang of kids, running home, with just one flash exposure using two remote flashes near the forest trail, firing at 1/20,000 of a second. The night was cold, fog passing through the forest created some condensation on my camera lens adding to the mystical effect and warmth of this image. Later that night, I fell asleep to the voices of river murmur and moonlight and things that blew down the forest path, past my sleeping hut and deeper in. As many of you know, we took out a loan from a farm supporter this summer, to take down our large, somewhat failing mobile coop. After the demolition, and during the season, we built two structures. The first was a quick for our old farm flock; the second build was a much larger, and fully insulated mobile barn for the new flock. The first image in this series shows both new barns, in late fall, just as we moved our two flocks into our storage brassicas. The remaining images are all made in one day, February 9th. 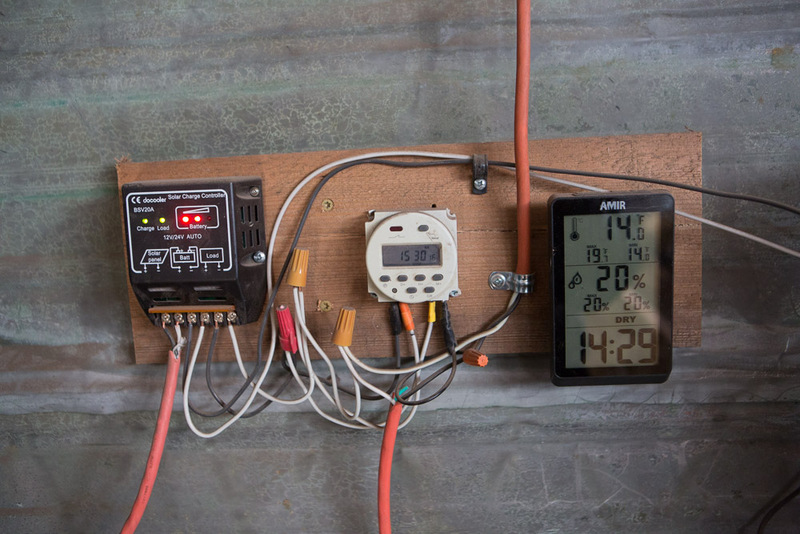 While our laying hens spend the majority of their days outside, these images of deep winter, when the temperatures drop to single digits, shows both the secret life of how we care of our chickens in deep winter and just what goes on, when the bulk of our two laying flocks spend a good part of the day inside: our chickens, behind the scenes, in deep winter. To navigate this essay, simple click on an image and use your mouse or arrows. Captions will appear if you hover over the images. I’m deeply grateful to Mary, for encouraging me to keep our laying hens when the first big barn went south, literally, and for the farm supporter who gave us a $3000, no-interest loan in the spring of 2018. We spent a bit more on that on all of this infrastructure, but without that initial injection of cashflow, we wouldn’t have had the courage to continue this wild ride, deep into winter. Above, our neighbor Mike places our new grain bin on cement-post legs we installed before freeze-up. Winter is the season of rest. Winter is a busy season of work. If that seems contradictory, we understand. But like much of farming, it is just one of those "both-and" conditions we are starting to get used to. A lot of people think we take winter off. That maybe we sneak off to Bali to work with chocolate makers and coffee farmers we knew from life-before-farming (we'd like to do that at some point), or perhaps that we've taken a sojourn south to the high desert on a quest to find the best varieties of roasting peppers. We'd like to do that too. But we are mostly here, and that is good. We take time to rest, a little better this winter as we finally have a warm and cozy space in our yurt (a Kickstarter update is coming soon). We get more sleep than in the growing season. We finally made it to dinner at the house of farm members who first invited us years ago. We've taken the time to bake some cookies, had enough friends visit to catch a whopper of a winter cold (and reminded ourselves as we slept it off that it's just another way of being connected to our community, embracing the common germs). We've been reading books. Or rather we've been devouring books as if we'd been starved of stories for far too long. Everything from sociological analysis of the southern border, to soil re-mineralization, to indigenous knowledge and local food, to straight-up entertaining novels and even at least one kid's book, we've been gulping it down by the woodstove in these dark evenings. Winter is the season for stories. It's also the season for repairs. Old metal in a chicken waterer, and other the things, finally give out and burst at the seams. We take regular trips to the welder's shop, for old repairs and new collaborations. I spend time online ordering sprockets and stainless steel bolts. It's a time when things sometimes work and sometimes don't. After making space in the schedule for a full day of research, online orders, and online classes, we find the internet is sputtering worse than our late Russian tractor. We pivot and spend the day instead learning-by-trying, to replace a leaking radiator hose on the truck. We high-five the next morning when no drips are visible on the shop floor (and wow, do we appreciate that shop and its wood stove for winter repairs). It's a season for building and improving systems. A few weeks ago the project was a 5-ton grain bin, farm-built from extension plans from the 1960's. Feeding our chickens over the past weeks has gotten so much easier, faster, and cleaner. There's no chance of wild birds getting into our organic grain now. We can purchase enough bulk feed to last 5 months. Before that, we had a quick run of small carpentry projects: a compost shed for household composting, skirting and decking for the perimeter of the yurt. When we list them all we understand why we are tired. Pouring 45 bags of cement before freeze-up. It's our building season, which boggles our professional builder friends, whose busy time of framing and building is in summer. Jean-Martin Fortier, one of our mentors (and part of the online class we are taking this winter), says that winter is about turning up the heat. 'Getting everything right so the summer can go smoothly. We hope it works. We adopted Malaya on a New Year's Eve 7 years ago, and she has loved every drive we've made together ever since. 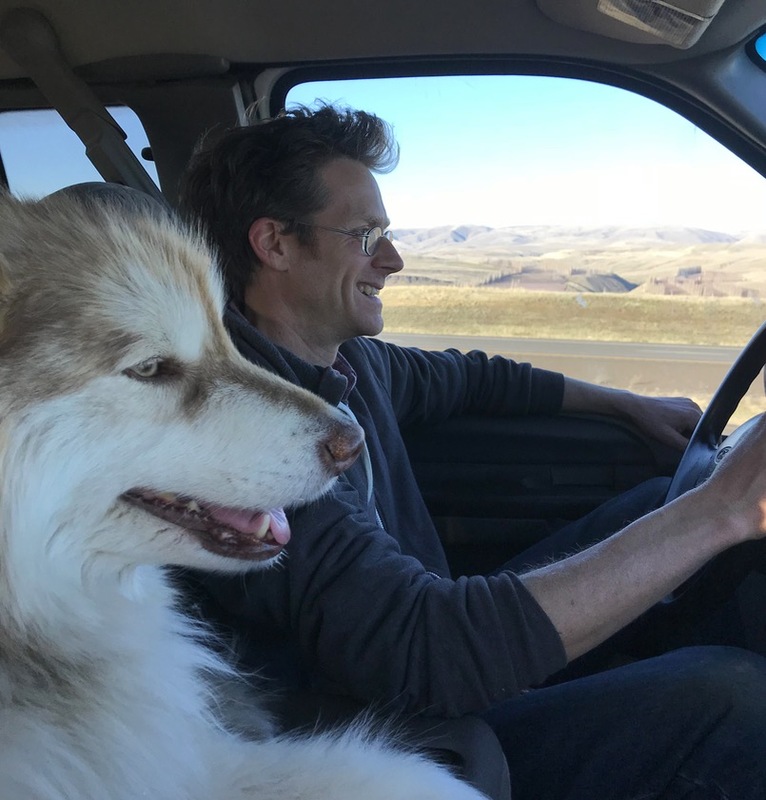 Here, she celebrates that anniversary by relishing the reverse direction of her first long trip with us, as we head up the Columbia Gorge and home after almost a week away, to attend family holidays and a dear friend's wedding. We've also started hauling and shipping in supplies: combining big bulky orders with other farmers to save on freight, picking up wax boxes by the truckload (we re-use used wax boxes for our chefs and co-op deliveries, and market), and lumber. Oh, the lumber. We use piles of it -- both new and a lot of reclaimed lumber. We'll soon start the construction on one or two small cabins, pending cashflow, for seasonal help. And next week we’ll be hauling in the steel ribs for the fourth and most likely the final tunnel in our lineup. Before the government shut down, we got notice that we’d qualified for cost-sharing from the NRCS (National Resource Conservation Service), so we’ve commenced with material gathering for that. Winter is hauling-and-gathering season. It's also when our budget gets stretched thin, so we are thinking a lot about core things: the farm vision for 2019, our income needs, and balance. We spend hours each day in our barn loft office, working on getting this right. Much of the wood to heat the barn came from farm friends, and while we hear the coolers opening and closing downstairs while we work, we are reminded of all the farm magic this past year. There's one special item of note. Just before Christmas a mysterious card with a sweet greeting and a fold of cash appeared in the mail. Mary and I used that for a Goodwill shopping spree, some yurt home finishing projects, and we still had enough left over to purchase bulk cookie making ingredients for friends and neighbors. The giver of the card wished to remain anonymous, and so we refrain from sleuthing or too much hypothesizing, to respect that wish. And in a beautiful way, it casts a sweet wide glow of potential as we acknowledge how many wonderful people in our lives it could possibly have come from. Other treats arrived, some with names and notes, and we are grateful for all. It's also, as every season is, chicken season. (This section from Mary's perspective, as Noah is too deeply embedded in the flocks for unbiased journalism). With just plants to tend, a farmer could choose to take a bit of complete winter down-time. Chickens, not so much. Noah manages the laying flock with a blend of deep affectionate caring (one could say fussing-over) and strictly regimented schedules. It's an odd blend of pre-school teacher and drill sergeant that is hard to describe. But believe me, nothing gets in the way of 10 am chicken hour, the appointed time for feeding and morning egg collection. 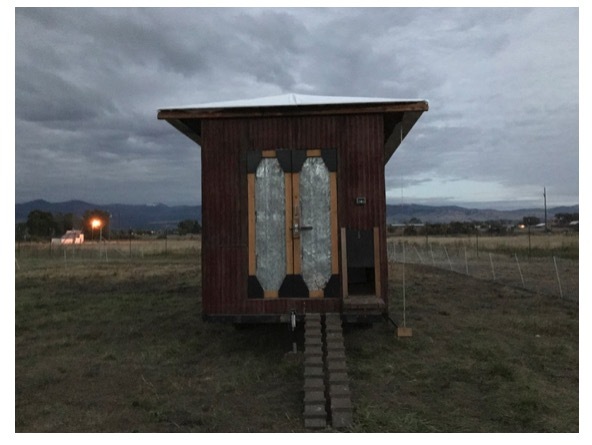 Unless, of course, he has to drive over to Idaho to pick up a reworked mobile home frame to be the base of, you guessed it, yet another mobile chicken barn. In that case I offer of course to take on the chicken chores for the day, assuming I understood the basics given that I hear about every detail of chicken care every day. Bad move--this duty is not for amateurs, and apparently I have not been taking notes. Through a slight misunderstanding (Noah had not done the morning feeding before he left like I assumed) and a few small mistakes in the order of things, I found myself trying to collect eggs amongst what can only be described as a mob. A mob of hungry, thirsty, rioting hens pecking at my every item of clothing, overturning egg baskets, and creating general mayhem. I got it under control, but not before one small mental breakdown, one medium hip injury, two dozen broken eggs, and a concerned phone call from Noah in response to my furious chicken-blaming text message. Seriously folks, this laying hen business is harder than it looks. We agreed I'd get better training before the time I needed to fill in; after all, our farm-sitter Hannah got a 5-page manual and several days of drills before we were willing to leave the farm in her care to attend a friend's wedding and family festivities on the West Coast at the end of December. Despite my one rough day, the flocks are producing well right on through winter, and the farmstore is loaded with eggs. You might not see Noah, but he's likely hovering somewhere nearby: manning the rigging on the ventilation wings that regulate humidity and air flow in the movable barns, bringing more alfalfa hay for them to forage or straw to fluff up their bedding, or preparing to move them to new ground once again. As we continue on in our winter season of so-many-things, you'll start to hear from us a bit more often. We'll be reaching out to farm members to discuss how their experience was last year, making a few tweaks to our feedbag program, and opening up farm membership sign-ups in early February. We're planning, ordering seeds and supplies, and trying to make the most of our season of learning and reflection. One of the biggest things we see whenever we pause to reflect is that none of this farming life would be possible without all of you. And so, again, we thank you for your support in all seasons. We hope you are embracing your season too (and we provide, below, a recipe for squash pie to help you do so…), and we look forward to continuing to connect throughout the season. The garlic is safely in and mulched. Of all the things on the list, we agreed that this was the most important. A few weeks ago, relishing the way our schedule opened up with the end of markets and regular wholesale harvests, I made the bold statement that the switch from daylight savings time was a good chance to transition to a more sane work schedule. I would no longer, I declared, be working by headlamp. It was fall, it was time to slow down, appreciate the seasonal changes, embrace the dark, be warm and cozy, etc., etc., etc.. That lasted about a day and a half. Two weeks into it, my headlamp is on even as I sit at the desk to write our newsletter, and I can hear Noah cutting metal by headlamp and work light out by the yurt (a final step in yurt platform beautification and wind-blocking). It sounds contrary to my earlier declarations, but this week I have enjoyed a quiet, starry night harvesting radishes by headlamp, smelling the blessedly warm breeze coming into to give us one last shot at all the things that have to happen before freeze-up. I've washed and bagged carrots by headlamp, and just tonight, bulk-harvesting the very last of the final bed of beets, I was struck into stillness by the beauty of a shiny rosette of beet leaves in the headlamp glow. It's fall, but it's not over yet. Tonight was, though, our final late-night headlamp harvest. We'll likely see single digit temperatures this weekend, so getting final rounds of greens and roots out of the field before the deep cold, and ready for your holiday meal required a little extra illumination. Balance, counterbalance, and stretch to capacity. Fall has something in common with unloading a borrowed auger. Mary steadies the bit as Noah lifts the auger out of the Stanley's truck with the tractor. We got our full value out of the 1950's auger we bought used last year, but had to admit we had finally worn it out. With a few more holes to dig, farm friends came to the rescue with the loan (again) of theirs. Thank you! It's been a wild week, the double-deadlines of Thanksgiving and the ground freezing solid. We had a scare earlier in the week when temperatures dipped near 10 degrees, and the top few inches of soil froze. We worried we could be sunk; there were still holes to dig, fields to clean up, and 100 pounds of seed garlic to split and plant. The urgency of freeze-up as a deadline is real; we've been caught out before, assuming there would be one more thaw, and ended up with row cover and field gear frozen to the ground till March. We're always late on planting our garlic, but we've always made it....so far. Our sense of urgency was heightened this year by news from a friend in Wisconsin who missed his window when their weather turned suddenly, and was left with only the option of planting it into his high tunnel. The amount of garlic we plant would fill 2 out of our 3 high tunnels, and where would that leave the early season greens, the cucumbers, peppers, and tomatoes? We fretted, and watched the forecast, ready to pounce on two days in the 40's, to tackle all the things. And there were a lot of things. So many that neither of us can clearly remember the beginning of the week....just flashes of a snowy harvest on Saturday, juggling heaters and temperature controllers into various spaces to prevent frozen produce on Sunday and Monday, a giant shuffle of winter squash, a big shift picking up and putting away wire hoops and sandbags and row cover. 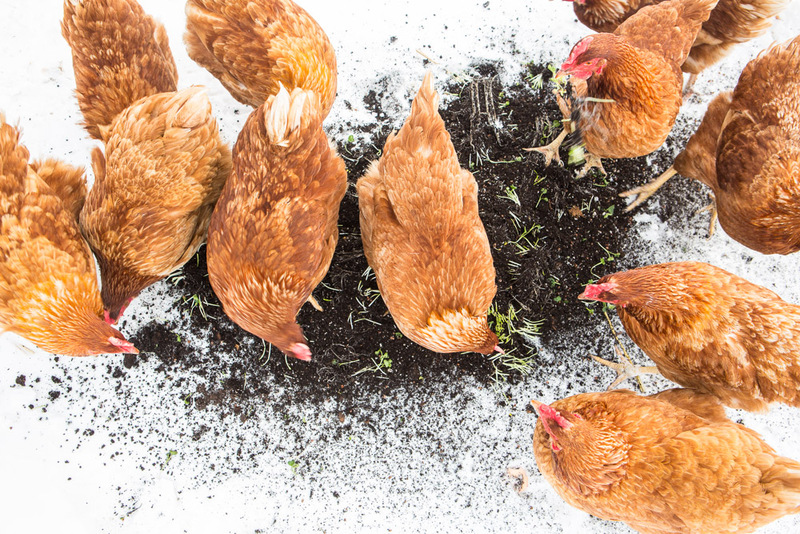 A second move of chickens in one week, to prepare more gardens to put to bed. Many rounds with the manure spreader full of leaves (then taking it to the welder across town for some repairs). Covering the garlic beds with row cover to help them not freeze deeper--it worked, they thawed completely and beautifully by Thursday. Harvesting out beds of radishes, beds of carrots, beds of beets, beds of greens. When a warm-up isn't guaranteed, you dig the carrots before the ground freezes any deeper. And sometimes you find secret carrot islands, the tip of the soil-iceberg. We're grateful for our tractor and under cutter bar this week, as the two of us harvested our last two beds of carrots in one afternoon, rather enjoying each other's company. With forks alone, that might not have been the case. Cracking seed garlic to plant requires hours of time on a repetitive, not mentally tasking job. It's the moment that, annually, we remember that there are movies and shows that we can watch, streaming through our laptop; and then immediately also remember we are out of practice at watching, and overwhelmed by the choices. We swung far in both directions....first a thought-provoking and sobering documentary, then a suspenseful series that suckered us into staying up cracking garlic by the barn woodstove till 1:00 am two nights in a row. We may all have an Amazon prime original series to thank for that sixth bed of garlic, since we had a bit more garlic separated than we'd thought. At more than one point, checking in as we crossed paths in different rushes, I could tell Noah had been downing spoonfuls of peanut butter. We needed the fuel. We didn't get it all done, everything from the list. But we got a lot done--and enough that there are plenty of things in the farmstore for you, enough to be able to clean up the rest of the field on Saturday. Enough that we're pretty much guaranteed to be back at it again next year. What many people don't realize is that all of next year's growing starts now. The garlic is the most obvious, the crop we plant as the last thing in the fall, the first thing that will show its green next year. Garlic ties one season to the next, but so much of what we're doing now is about the next year. We suffered this spring from quack grass and other weeds, when last fall we couldn't get to that critical field prep around so much building. Slowly, slowly, we get a little bit smarter and better prepared each year. But the building that fall was also worth it; with that cozy yurt to return to, to make real meals in, between the peanut butter and apple binges, we're reminded every day of the support of our entire community, that keeps this farm going. As we had towards Thanksgiving, one of our favorite holidays, we'll take a little time to turn off the headlamps, embrace the dark and the season change and the coziness. And we'll be grateful for all of you. We'll also eat something other than peanut butter, we promise. This week, while the farm harvests chugged on, I spent all day Monday re-doing the roof on our smaller, three season chicken barn. Yup, the one I built this past summer for our older, aging flock. As I fabricated awnings for the new fabric roof on Sunday, cutting out one by pine on a jigsaw with the pattern I traced, and then glueing and mounting it to a mitered piece of fir lumber, I ponderded the misinterpretation of my builder-friend's advice when I checked in with him about the curved roof and using the reclaimed trusses: I wondered how the roof went so wrong. We've made a lot of building mistakes, and our projects are just large enough, to get in big trouble. That little carpentry issue, to fix the leaking metal roof with a new 10-year fabric roof, that could bend to the curve of the trailer trusses, was creating some wet chickens, certainly not helping to add to the production of our older flock. The wet chickens were also making wet bedding, and that can lead to a variety of problems, both with the chickens and barn. But, by noon on Monday, I had torn off the old roof, installed the oiled awnings, added a perlin to the ridge, reinforced one of the old trailer trusses, and just as it was getting dark, I pulled the fabric roof over the new reflective metallic insulation from our neighbor Brian and, as it was getting dark, I fastened on the fabric with a bit of Mary's help using ladders and our tractor forks as a scaffold. The next days of mine were spent grilling irrigation experts from around the country as we make decisions on getting water to our crops this season (after our ditch water shuts off on Sunday): putting that new well we had drilled this summer into service. There are hundreds of decisions. I grilled Benjamin, our sales guy from Dripworks for a hour and 45 minutes on the phone. I talked to a local pump expert who wanted me to hire out the project to him at the rate of $115 an hour. I talked to farmes who had re-done parts of their own irrigation. I spoke to my friend Leon, naturally, and when I explained to Bob Gingrich this afternoon, when I was picking up 80 bales of straw for farm projects (including winter chicken bedding), that we still have crops to irrigate through November, he raised his eyebrows -- all the conventional wisdom alfalfa growers have in our valley is different from our vision of feeding people, and the income requirements for a market farm like ours. I came to the conclusion that we'll need a whole new pumphouse and a variety of frost protection strategies for our new system. I filled a notebook, talked to more people on the phone, and we have another 10 or 20 hours of desk work this weekend before we start ordering and gathering parts and pieces for this new engine of the farm that will help us reduce our labor, weeds, and help us farm on the shoulders, on the edges, and find a model that works for us -- and, of course, you. Having salad greens into December -- and all we have at market is a feat. We are tired, but we love it all, mostly, and desperately need the income. The parts and pieces of this irrigation system, not inlducing the insulated, very small building, will be in excess of $4000 by the time we are finished. But to do it well, and sustainably, we've learned that we need to put good systems in place. And I'm so fearful of failure. Because we've rebuilt chicken barns; and a new roof; so many things. And becuase people give the best advice, but our systems are new, and sometimes even untested. So, back to my mis-understanding of my friend's advice that led to some of my accidental, but planned carpentry this week. You, and all of us, had made us grow up a bit this season. I don't always like the cautious farmer I'm becoming -- sometimes I even doubt Mary's wisdom too much -- but you've all made us grow wiser and stronger. Come on out to market tomorrow. We've been hard at work this week, uncovering crops that we've protected with frost cloth for the harvest, and then spending hours re-covering them. And sometimes, making mistakes, covering them again, because we didn't add enough pins or sandbags to keep the cover from blowing off. To keep our peppers from freezing we ran backup heat in one of our tunnels this week and dillengetly made sure that the last of the curing winter squash were protected. This, was a real feat since we are pretty much out of space, with some onions and potatoes under our barn lean to, almost out of the weather, but they are in line behind other stuff that needs space to get into our walkin cooler. The chickens, both barns, also got a solar light setup - a necessity, we've learned, for winter egg production. Given so many out of power in our country, without backup systems, the irony of this didn't escape me.This was the last big item on the barn construction list and I keep telling Mary that we'll need to have a celebration. Don't wait for that though -- come on out and see your farmers today. Our colleague Lindsay declared the month of August to be the time of farmer-grumpies, but Mary and I think it's really this time of year. As the light ebbs, and I wake up, sometimes before the chickens, we look to the rooflines of our hightunnels for signs of frost. As we start the coffee, and listen to our country's divisiveness on NPR, we look at our task list, and like a Senate committee arguing, make hard choices about what vision of the day to cut: what valuable repairs that need to wait. And we put off the conversation, for another day, about how to get a better packshed, and build the farm so it's a well-oiled machine, a place for all of us. And then all of you. And then it's tonight. I'm harvesting cherry tomatoes, and grumbling about the additional transplants to add to some of the rows, and bits of tools not where they should be, Mary calls me on the phone. "Malaya's been skunked!" she murmed. This wasn't the first time this has happened on a friday, and while I gathered buckets of warm water, Mary mixed our recipe of baking soda, dish soap, and hyrodgen peroxide. Our dog whines in protest, then vomits and then, everything was fine. We smile. We eat second dinner. First dinner, I'll confess, was fruit, crackers, and ice cream bars. I wish as I write, I could say all the harvest was in. But it's not, and we'll be up early, gathering the last things. Our salad greens are in full swing. Our summer squash is all in, and this is the very last of it (the last beds will be mowed on Sunday). Some fall crops, like turnips and kale and radishes and leeks are in abundance. We have more peppers than is possible to bring to market; so if you can't see us at market, you can always visit the farm store. And those potatoes in the cooler that froze last week were cooked and fed to chickens, along with hundreds of pounds of radishes that got too big. The eggs should have the best flavor of the season yet. Some come out and load up. We've been perfecting our hot sauce recipe all week too -- Mary has got it down to a science, and that will be our featured meal kit this week. Our hot sauce is very hot, but it's good on absolutly everything, and we have good ways to make it mild too. If Mary and I agree on a good transport method, we'll be bringing some of the first gourds to market, too, part of the winter squash wave, that's been curing and sweetening, to come. And finally, thanks for all the replies about our newsletter last week. They meant a lot; during these final series of markets (I think there are 5), all the income counts for us. On Sunday we must finish the fall plantings for the last November farm member pickups and our early winter plantings -- which mean we can stock the farmstore nearly all winter, so we are bracing for that. And in the background, I've been doing the last, um, painful carpentry on the new chicken barn and growing pains of managing two flocks with overlapping ages. The new barn is 40' long, dwarfes the 20' long three season coop (housing the older flock). It's nearly perfect and it's been moved several times, each move successful, easy, and to new pasture. 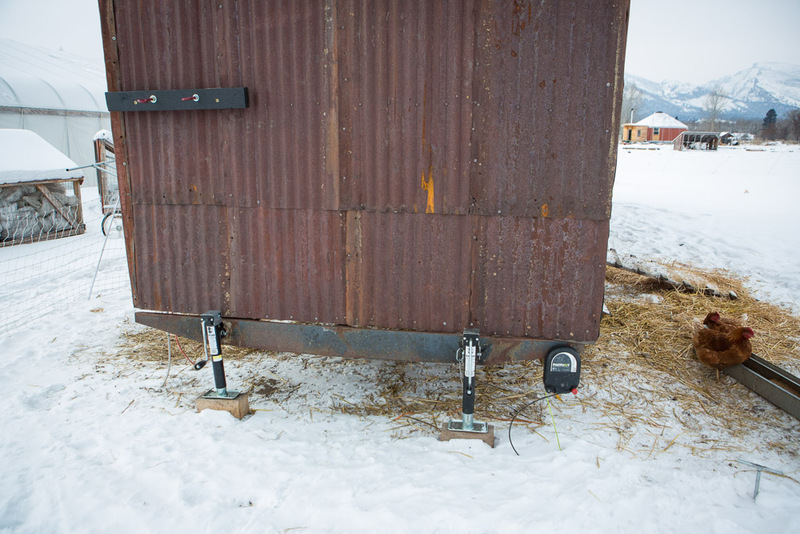 But there's the small matter of making some painful and expensive final adjustments to make sure the moveable barn makes an ideal home for our new flock and and it's rock solid, not only all winter, but for future generations of Sweetroot Hens. I'll be writing about it when it's all done. Our primary irrigation will shut off in just two weeks, so we are working on a very important, time sensitive project to get fall irrigation to crops: it's part of making the home farm future ready, and it's a big learning curve, more than we want to take on at this point in the season, but we are digging in deep. So come see us. Share a joke, coffee (I don't think we'll be bringing any, sorry, it had to get cut from the list), pick up our hot sauce kit, and all else you can handle. There's so much to say about that photo above, the larger of the two new mobile chicken barns we built this summer to replace the single larger barn that failed this spring. So many people to thank along every step of the way, stories to tell of late nights, intense negotiations for time and resources, all the orders of new gear (complete with jokes about chickens having discovered the poultry supply catalogs and online ordering), and the relief of finally settling the young pullets in late this week, and pulling them out to the back pasture to begin their new era as the main laying flock. Hopefully we'll return to those stories, to properly thank all the hands that pitched in on everything from stuffing insulation to welding the 3-point hitch that lets one person easily hook up and tow these barns. This was a major project, with "get chickens into new housing" identified as the #1 priority for the week. It marked the third week in a row, though, that some major long-term project was top priority, meaning some chefs had to put up with late deliveries, some items occasionally ran out in the farmstore, and we had to judge carefully what and how much we could push to bring to market, and what might have to get cut at 2:00 am from the harvest list (sweet Italian peppers made it, brewed coffee did not, I'm sorry). Two weeks ago the top-even-above-market priority was to seed cover crop in an area that had this far been only pasture--that final market of August, I remember picking peppers in our high tunnel by headlamp, while Noah ran the tractor, tilling in the seeds we had spent hours of Friday scattering across the soil, our first fall-established cover crop, a huge and necessary step in giving our first field a chance to rest and keeping our soil and plants happy and healthy, but still difficult to fit in to a busy summer. As I picked, around 11:00 I heard the tiller start to hit rocks, and thought "ok, he's at least 3/4 done." It dawned on me that I knew that because I knew that there were only two rocky patches in the field, which meant I knew where he was. He later told me that he heard me start up the truck to pick up peppers and tomatoes, and knew from that sound that despite the goal of taking a modest harvest to market, it must have been quite a haul, too much for the garden cart. Those two parallel recognitions of what was going on on the other side of the farm, from subtle noises and cues, stick with me as I remember these intense weeks of trying to manage a hyper-productive vegetable operation at the same time as building up our basic infrastructure. We so often feel like we don't know what we are doing, like we fly by the seat of our pants on things we should have much more dialed in by now; sometimes it feels like each year we farm we only discover that we have more to learn, know less about all this than we thought. And yet, we are getting to know our place, and each other, and you, bit by bit. Four years ago at this time, I didn't know there was a 30-foot wide rocky patch at that point on our land, nor that things would grow there, with a bit of rock-picking, despite that; I didn't know that poblano chilies grew surprisingly well despite our cold nights, and that they are incredibly delicious; I didn't know that you all could eat *so many* eggs. I didn't know that my farming partner would be so skilled, so resourceful, so determined, so aggravating and inspiring (at the same time) in his dedication to constantly improving and returning to the big picture goals. We didn't know the community that would grow to want, even need, the food we produce, and how much you all would support us. We are learning. Slowly, sometimes painfully, but we are learning. This week, we'll be at market with, um, almost everything. We'll likely continue the pattern of one farmer man/womaning the booth, while the other returns home to get a few more things, check the chickens, and run a delivery. Please be patient....whichever farmer it is will certainly have had too little sleep last night. But do come see us, please, because despite efforts to scale back the harvest in the wee hours of the morning, there is so much good food! We suggest that you put hot chilies, tomatoes, and kale into your scrambled eggs, that you roast potatoes with onions and garlic, that you dive into the newly ripening sweet Italian peppers (Jimmy Nardello is ripe! ), enjoy the newest batch of baby carrots, and stock up on garlic for the season. We'll bring probably the last of this year's melon crop to market, which have been just delicious. Please, some see us there! The smallest, biggest thing we did this summer: winter rye germinating to prepare the way for next year's summer crops. "Let's bring it in for a minute," I said to our crew of Hannah, Kayla, and Mary. I shut off the tractor and meet the group, standing with harvest knives, Felco pruners, gloves, and pallet bins at the ready. We are about to begin. I set about explaining about how this tradition, of putting up harvests, we started years ago, like farmers I've worked with in China, Nigeria, Kenya, Indonesia, Egypt, and Turkey. We all have a harvest to put up, a need to feed people. When I got to the part about how we feed 50 families, and each squash might feed a neighbor, or two, or three, how many meals it can all be through the winter and into the spring -- and how we touch lives -- if we get our curing right and get the harvest done....and somewhere in there I lose it. I wasn't sure why I started crying in front of the crew. I kind of shocked them; I shocked myself. This time of the year, Mary and I are exhausted; we've been burning long, days for many months now, and it's not over yet. That's partly why I broke down in tears. This past week our full helper, Hannah, was out sick, so we were behind about 30-harvest hours by the time we hit the end-of-week market harvests. One night when we got a frost, and we didn't have time to cut all of our last basil, I ran backup heat in one of our tunnels to save it. I put it all in huge bags in the farmstore the next day, having successfully gotten it through the cold. But by the next night one of the coolers misfunctioned and it all froze, right there in the farmstore fridge. I tried to convince Mary that we had to pull levers (our codeword for canceling some things or doing something crazy), and I think I had her considering more seriously than she ever has, to bow out of market this Saturday. But in the end we decided we couldn't skip a market, missing out on both income, and letting down the people who depend on our farm food -- especially our members. Letting people down seemed more crazy. I reminded her that I had carpentry projects, and the cooler project to start on, and water lines and an updated irrigation system to put in place before our ditch water shuts off. I reminded her that we probably have more than one acre of salad greens planted. She reminded me that those salad greens are planted, after all, for people to eat, and that we'd never get through to our 50 farm members on the phone to let them know of a change, and just how many people would show up expecting to find us, and our need to get income from these last six Saturday markets. She's right. So we agreed to harvest what we could, and declare that it was enough. Is it enough? I find myself asking that a lot these days. While I use my body as a tool, and focus on efficiency, I still have to figure out how to fix that cooler, source a part (and I'm so tired of sourcing parts), or buy a new $3800 one. Mary and I are currently turning over two tunnels -- one with dwindling tomato produciton and another with cucumbers that have finished for the season. I'll be clear about this. We do have great transplants ready for the two tunnels, and we're exctied for the deep fall and winter greens they could provide. But, if we could right now, we'd just let the tunnels freeze out, and clean them up, well, at our leasuire . We are going hard, partly because despite all we do, we aren't sure if it's all enough. This time of year, this year in particular, we crave a change of pace, of focus; we want to can salsa and fill all of our freezers with summer bounty, curl up with cups of tea and start recovering. We want to craft a life, and create a harvest season that involves stories, community, and love. Sometimes it's not enough-- this farm that we've all started isn't achieving some of our biggest goals quite yet, even as it produces more and more food. We worry that some of our farm members -- and cusomters -- come with a shopping list pulled from magazine recipes rather than an open mind about what they could cook from the 50 types of vegetables we have right now. There are days when it doesn't seem enough. And, in the evenings, when we sneak in admin to pay bills, make sure supplies get ordered, plan, we dream about reorganizing the barn so we have a workable packshed, sometimes we just have to call it at 1 or 2 am and fall asleep exhausted. But also there are days when piles of gifted firewood are delivered by friends, days when our extension agent comes to us (with an engineer) to give us ideas about that irrigation system, and a farm member drops off beer and cider. Nights when a friend brings by second dinner when the first dinner was Brewery takeout that on the invoice just said FARMERS, in all caps. The fall harvest light shines off two chicken barn roofs in managed pasture and across cover crop and it seems like we are so close to getting things right. And then a cooler breaks. Or I have to rebuild a tractor hub. Or a neighbor lets me know, in their own way, somehow in the mele of the season: the texts to chefs, all the work trying to get people out to the farmstore (our most reliable and stable source of farm-income), that somehow I've crossed him, done wrong with the world. We love large harvests. That's why we grow bulk salad greens for months on end, not just a few patches in the spring. It's why I have 80 puounds of that spoiled cooler zucchini I fed to the chickens today. It's why we have buckets of eggs. It's why we can fill half a walk-in with storage crops and it's why every year Mary and I look at all the winter squash and even as we feel a deep satisfaction at the piles of sweet stored sunshine, we also feel a pull to next year, perhaps, grow even more. We love it. Partly and mostly. And sometimes, when we lie in bed at night, in our yurt, I tell Mary of how stupid I used to be, working with farmers in Borneo, planting upland rice. I had no idea how worried they were: just like me. When I interviewed then, in the evenings, during the weeks of planting and harvest, they talked about how the varieties were important; and the impact of bad germination. But I think, as I press in those spinanch seeds, trying to eak out one last field planting, and I press in the seeds with a roller I've made, on a bed of soil that I've been preparring for weeks, I finally know. And I shake my head and lie down in that little row pathway, or the tomatoes, or the zucchini that I kept alive in the field, with cover and incantations, that combination of science, knowledge, gut and luck that we are on the cusp of finding and losing, I realize deep, that this harvest we are both winning and failing. And I cry. Out of control, out of worry for failures that we have, failures that we do not yet know we have, all we have grown, and all this farm makes us grow up to be. We both long to be better and you make us better, all at the same time. We'll connect those waterlines and get a pump and wire it and run lines the best way we've studied on our secret farm dream map. I cry because even as I grow, some days I barely can give Mary the support she needs for her own growing and getting through. And I cry because we know no matter what, you all care, love deeply, you trust us, you share your own confessions, and have hopes and dreams for this place, everything that the farm touches. Everything we all touch. See you at market. Or at the farm. Or both. Though we've been quiet on the emails lately, we've been thinking of you, and wow do we have some good veggies ready for you right now. The farm store tomato table is filled edge-to-edge, the coolers are stuffed, and we think a little August chill like this is the perfect boost to start thinking about winter eating. After weeks of sweating and watching any un-irrigated corners of our farm get dustier and dustier, we were kind of grateful for the preview of fall that came yesterday (even if it required three changes of clothes to complete the rainy epic harvest of salad greens for our growers co-operative). We're still wearing wool hats mid-morning, and we had our first little fire in the yurt last night to dry out and warm up. It gave an extra nudge to the urge we've been having to start putting up some of this summer bounty, a good reminder that our average first frost is only 10 days away, and that all this abundance is as fleeting as it is overwhelming. I think it's a common thing for vegetable farmers in August to be simultaneously very tired and very strong. We lift hundreds of pounds of tomatoes, peppers, potatoes, summer squash and cucumbers, over and over; I have to remember if one of our chefs orders 80 pounds of cabbage, to divide it into reasonably sized cases for normal people to lift. But the vast majority of our produce goes directly to you, individuals families, farm members, market and farm store customers--and now's the time for you to do some lifting, too! We are starting to offer discounts on 10-pound and 20-pound flats of tomatoes, bulk quantities of beets, kale, chard, and summer squash. Farm members, remember you can take your additional 10% member discount off of those bulk deals, as well. Yesterday we snuck in our first batch of tomato sauce by throwing onion, garlic, a whole flat of grade-B tomatoes, and some wilted basil from the farm store, into a huge pot while making coffee Monday morning. We just blended it all up (skins and all), after letting it simmer all morning while we worked. It's now in the freezer, and the first 5 tally marks are on our "Winter Food Dream List," a piece of paper stuck to the yurt fridge, listing all the things we'd like to have in our freezer and canning pantry, going into winter with a real kitchen for the first time in 4 years. On Sunday we managed a small batch of sweet pickled beets--not canned, just a fridge pickle batch, and we'll have no problem eating them up in no time. It's really the time, now, to stash away whatever you can of summer for later. We both grew up in families that did quite a lot of that, so it's a natural process for us, but I know it can be less familiar, even intimidating for many people. One beauty of our information age, of course, is that even if your childhood August memories didn't include clouds of steam from the canner and a mist of boiling vinegar for pickle brine, it's easy to find directions and recipes for putting up food. I still treasure the paper cookbook from the Ball Canning Jar Company I won at the 4-H fair at age 10, but the modern version is their website, loaded with seasonal recipes and clear canning directions: https://www.freshpreserving.com/recipes/?prefn1=ingredients&prefv1=Tomatoes If canning, I do encourage you to pull recipes from trusted tested sources like the Ball website, or county extension agent websites (beware of random food blogs who may not have truly tested recipes for food safety). But if canning intimidates you, or you lack the time and equipment, we really encourage you to take a few moments here and there to stash things into your freezer--grate some summer squash in the quantity required for your favorite zucchini bread recipe (if you're really good, write the recipe on the ziplock bag, so you have it on hand when you pull it out of the freezer in January). Onions can also be chopped and frozen, in 1/2 cup or 1 cup increments, ready to use in winter soups; or chop kale, garlic, and onions together, stuff into a ziplock bag, and freeze for adding to a frittata or a soup. Fresh salsa gets a bit watery when frozen, but honestly we still think it's pretty darn good in February. If you have time, make our roasted tomato soup and freeze some of it for winter too, in freezer-safe jars or ziplock freezer bags. We're printing out extras of many of our favorite recipes to have on hand in the farm store, and we'll be there hosting from 3:00-7:00 tonight, so we encourage you to come on out then for a chance to talk to us, get tips, or share your own favorites with us and fellow farm friends. If that time window doesn't work, remember the farm store is open all the time, self serve. It's a great time to take a little walk around the farm and see what's happening--and if you have an urge to get your hands dirty, we even have a few not-too-strenous tasks you can jump in on this afternoon, like cleaning and trimming garlic to make room for our onion crop to come in and cure. If you linger, Noah may put you to work on the new 35-foot 4-season chicken barn--you can't miss it when you pull up to the farm store. If you visit the farmstore, or the market this week, we know you'll eat well....and we encourage you to make a winter dream food list of your own, and start putting a little bit away for later, too. Overnight, as predicted, a storm front moved in. Over the next twenty four hours, we expect up to half an inch of rain, or about 5 percent of our yearly precipitation. As I write behind the soundtrack of the roof on the barn, I’m reminded of days spent under tin roofs in Borneo, and in the thunder of rain on shopping malls in Asia where I used to take refuge. It’s our own version, just for today, of the rainy season that descends upon Southeast Asia for months. I’d often think of the rainy season as marking change; helping regulate climate, and preceding feasts of fruiting seasons during the period where dolphins mate, and forest planting and harvesting cycles shift. Our cycles did indeed shift over the past couple of weeks. We have finished all of our main planting, with just the weekly plantings to do, some flowers, seeding for fall, and some final flower plantings. Our summer crew started. And next week, summer memberships will start and if we aren’t yet fully ready, we will pretend we are ready. I greet the summer season with hope, and with fear. Mary and I look forward to our cash balance shifting, from mostly all expenses, to more income. I track our egg production and the expenses of our rapidly growing young chicken flock like a general at war. We think hard about how we can make more time to breath on the farm, to create, grow, and nurture but we still fall asleep around midnight or 1am with piles of lists not finished and too much to do. Emails and voicemails start to pile up, and we work through them, late and early. We triage, we fix, and somehow this week, in about three days, I managed, with just a little help with Mary, some phone calls to my buddy Scott, and after some welding fabrication from Glenn, I managed to put up the bones of the new wheeled three-season chicken coop. Trusses and a roof will go on once this rain stops. We worry about the tension of managing everything, keeping our other accounts (our wholesale income is shifting, unexpectedly), but mostly, we try to rally our spirits, breath deep. I think of our farm, these days, as a tiny village. When I buy screws at Don’s, now it’s boxes (for the buildings). When we buy wood, it’s bunks. And when we greet families that pile into the farm, on Tuesdays or any day, it’s with tired, open arms. When a friend shows up unexpectedly to visit, we ply her into a potato planting that last for hours and then cook her dinner at midnight. And when one of our more distant neighbors starts burning waste, we reach out, diplomatically, like a village concerned for it’s people, food, and health would reach out. We broke up one dog fight too this week (sorry, Amanda, Malaya is very protective of her kittens), but people in villages do this too. In an unrelated incident, Deputy Brandon stopped by to admire the new construction project and get a speech from me about our role in this village. Trudy, who after seeing what the fence project did to my hat, brought us real SweetRoot Farm hats for the crew! Amy, when she was bringing treats to our chickens left us beers in the farm store fridge! And, I almost forgot: hours before we borrowed neighbor Dorea's headlamp last week, on Friday (why we decided to plant on a friday, I don't know) Toby found us temporary collapsed in the weeds when she brought us muffins. I still can’t believe that all of us, all of you, make up this thing called SweetRoot. I have thought a lot about mothers this week, and this spring. When Noah's dad visited last week he shared with us one day that it was the anniversary of Noah's mom's death, lost over 20 years ago to cancer. I so wish that I could have met her, and I wonder what insights she’d have into this stubborn, idealistic eldest son of hers. She was, from what I hear, really something. Knowing him, that doesn’t surprise me. Noah met my mom just in time. The fall that we moved in together we shared a little above-garage apartment in Forest Grove Oregon, about an hour and a half from my parents' farm. The fall weekend that I took him to meet my family, we loaded a borrowed cider press, Noah’s camera, and three loaves of slowly rising sourdough bread into our car. He was so nervous about this first meeting that he insisted on the projects; sitting idle, as you can guess, is never a comfortable place for him. But he needn't have worried; my family embraced him heartily even as he encouraged my niece and nephew to climb farther up the trees and bounce vigorously on the slender branches to bring down more ripe apples. In the midst of the wild, juicy, sticky project, I slipped into the kitchen to check on the bread that had been rising through the morning's apple gathering. My mom found me peeking under the towels, and leaned in conspiratorially. "He bakes sourdough bread. I think I love him too," she told me with a grin, and gave my hand three quick squeezes--an old signal from when I was a shy and quiet child, our secret code for "I love you." At that time, my mom's hands still worked for most things, though a bothersome nerve condition had started to make it hard for her to sign checks or tie her shoes, and her once lighting-fast typing speed had slowed to just slightly below average. She had recently retired from her job as administrative assistant to the Department of Foreign Languages and Literatures at Oregon State University, and was looking forward to more days of gardening, canning, and watching her grandchildren gleefully risk life and limb for home-made apple cider. When it was time for us to go home my parents loaded us up with fruits of their garden: tomatoes, zucchini, green beans, cucumbers, and beets—the gifts kept coming and Noah's eyes grew wide at the riches. Our little raised beds in the yard of our rental were fun, but the yields were nothing of this scale. My mom just laughed at his thanks, and said something I had never heard her articulate before, but that I will never forget: "I think my real purpose in life is to feed people." She had worked as a teacher's aide, a secretary, a mom, a farmer, and then in university offices when the farm income simply wasn't enough to cover the needs of a family with three kids entering middle school sports, orthodontia, and college prep. Feeding people wouldn't be the thing you’d pick out from her resume, had never been the focus of her working professional life, and yet of course, there it was, in the background, all along. She was the core of the group that ran the kitchen for our elementary school's outdoor camp week, the one who brought both the recipe and the 10-gallon steel mixing bowl for baking a whole school's worth of oatmeal cookies in one batch. The daily milking of our family dairy cow was both her quiet meditative time and the source of our family’s milk, butter, and ice cream. She was the one who changed her department office tradition of Friday break room treats from sweets to soup and home-made bread. "Those poor graduate students need something more substantial than brownies" she would declare, tucking a crock pot of chili into the backseat of the car on her way to work. 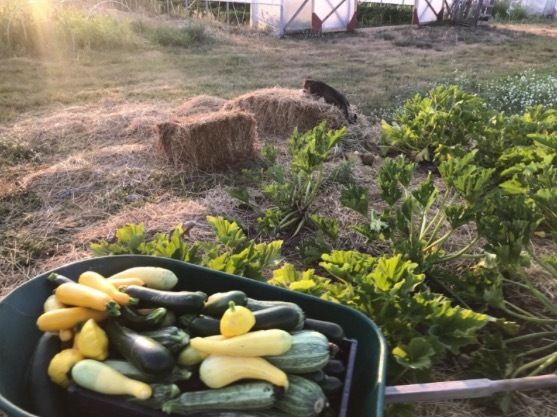 In summers, treasuring any extra hours of vacation time to be at home and garden, she'd return to work with a basket of vegetables, tucking an heirloom tomato, a fresh cucumber or zucchini into the professors' mailboxes in September. Of course she fed people. And it fascinates me to think of how certainly she said that, and how it made sense, when I stopped to think. That statement of purpose is particularly bittersweet, given what has happened in the years since. That hand-brain connection issue, first diagnosed as benign and non-progressive, turned out to be the tip of a more serious iceberg. These days, my mom really doesn't feed anyone else, and often needs help from my dad for even the process of feeding herself. Over the last five years a degenerative brain condition, frontotemporal dementia, has eroded away so much of the mom that I knew. With every visit home I find another bit of her missing, a conversation no longer possible, the ability to hug no more. The secret three-squeeze signal for “I love you” is too much now for the missing neural connections. The gardening is gone, the basket weaving is gone, the wool spinning is gone, and the ten-gallon mixing bowl has not made those oatmeal cookies in years, though my father learned to make the family granola recipe in it, ands sends us home with mason jars of perfectly toasted oats, seeds, and walnuts from their tree, so unlike anything from the store. Noah has stories, too, of his mother and food. At holiday time she’d send him and his brother out through the New Hampshire snow, harnessed to a sled, to deliver fresh cranberry citrus relish to the neighbors. Their own home garden blends in his memory with the extended family garden of her parents, his grandparents, and with the family vegetable farm down the road, where he worked as a kid. I thought of both those mothers when I read these lines in the book "Braiding Sweetgrass" this winter: "The land loves us back. She loves us with beans and tomatoes, with roasting ears and blackberries and birdsongs. By a shower of gifts and a heavy rain of lessons. She provides for us and teaches us to provide for ourselves. That's what good mothers do." Though we miss them, we are grateful to have learned and been given so much by our mothers, and I like the idea of leaning into the land, too, for good mothering. An indigenous Dasun mother who Noah stayed with (and photographed) in Crocker Range National Park, in Borneo, plants tapioca root in a forest farm. Mothers day for many can be cozy, sweet, worthy of all the flowery cards. If your mom is near, I hope you do celebrate in person with some good food. For many it is not so simple—perhaps you miss her, perhaps you never knew her, or never got along. Perhaps you are struggling in your own role as mother, or wishing to be a mother. For all those for whom it is a harder holiday, what do we do? For us, our best answer always still seems to be food. To feed each other, in her honor. To dive into some good hands-in-the-ground work, towards feeding people, and feeding ourselves. We hope you can celebrate a mother in person, by phone, or in some way that fits your family best. If you are still searching for a good way, we invite you to consider a gift that helps us continue that feeding-people purpose, and also quite likely helps a mother feed her family. In the second year of our eatership program, which provides free or reduced-cost farm memberships to those who would struggle to afford them, we have seen again that the most common type of application is from a single mom trying on limited income to provide for her family. We love having two of these families already in the membership for this year, thanks to some early donors. I know that our moms would both approve, and if yours would too, please consider making a gift, through our link here. 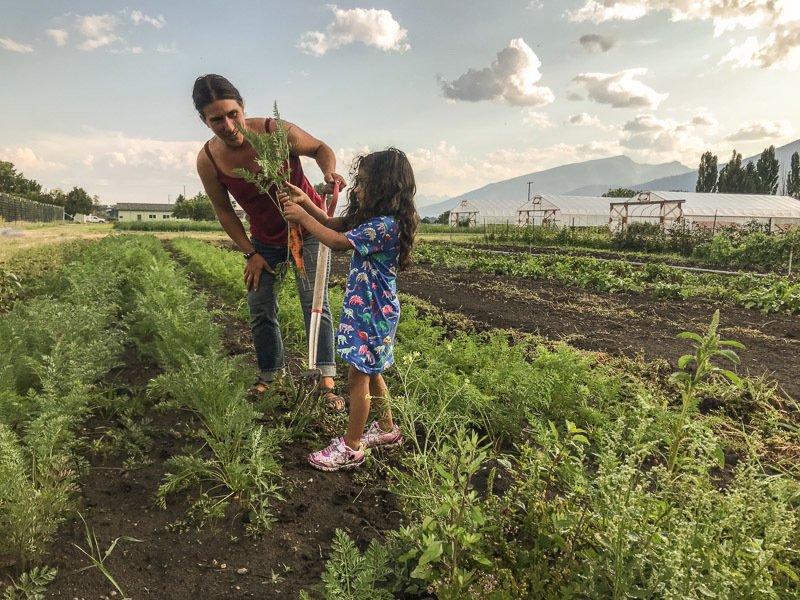 We aim to have about 10% of our farm memberships awarded to lower income families via the eatership program, and with your help we’ll be able to offer free memberships to another 3 families this year, and meet our goal. If you'd like to apply for an eatership, just fill out this simple form on our website. If you found us at market or if you visit the farm store for some produce, please eat it this week with a feeling of love and nurturing from the land--from the earth that manages to love us all, no matter what. Blend all ingredients in a blender, or a wide-mouth jar with an immersion blender. Taste, and experiment with adding more of any of the ingredients till it suits your taste. This recipe is very forgiving, and widely adaptable to different palettes. If you are diligent, record what you add and start with those quantities next time. If you free-form in the kitchen, just add a slosh or a slug of each and keep adding and tasting till it matches your mood for the day (don't worry about making too much, it always disappears quickly). Sometimes we like it sweeter, sometimes we like a vinegar bite, but it’s easy to whip up and goes well with any kinds of greens. It sounds especially good right now with a spinach and chilled grilled chicken salad. Still standing. That was our motto this week. This week was a doozy. We finished our newest high tunnel, installed some new micro-irrigation, did dozens of repairs and maintenance, and tackled one of our biggest early season problems. Quack grass. We didn't get all of our timing right late last fall (mostly because of our building) to disrupt and freeze quack grass with good late fall preparations. We've spent all week removing quack grass from a few of our gardens, in dozens of 2 and 3 hour shifts, as we plant. We will tackle this problem with a rather large labor crew Sunday, in order to keep on schedule with plantings. We are striving hard to eliminate weeds and minimize hand weeding as much as possible on the farm this year, so we are getting ahead of it by planting in beds that are as free, as much as possible, of perennial quack grass. It's really enemy number one on our farm now. Mary and I talk about what to do about it, how to eliminate it, how we will cover crop new ground this summer, and how we will innovate our soil practices pretty much all the time this week. And then there was one eagle too. I was moving chickens at dusk, and while the flock was a little dispersed, following the listing chicken coop to new pasture, and an eagle swooped down grabbed one of our laying hens. I jumped off the tractor and took one flying leap. And while I didn't manage to actually touch the eagle, I did grab the hen, and wrestled her to safety. Her wounds are healed, and while eggs are in rather short supply on the farm now, and typically only available in the farmstore, I'll bring eggs as a celebration of sorts, that after all this, we are still standing. We are loaded with greens, and we'll have plenty at the first market this morning. We'll be at our usual spot at Bedford. For those members who cannot wait for our first Tuesday pickup at the farm, come fill up! You can use your old feedbag or we'll provide one. If you are considering a farm membership, we still have room for a few more spring season shares, and we still have room for about 15 summer and fall members. You can signup on our website, or come see us tomorrow, sign up for memberships, and load up on greens. If you can't make it to market, and are a farm member, you'll get a formal announcement about the beginning of the season on Monday. We'll be polishing up the farmstore slowly near the end of this coming week, but greens will be in the cooler for those of who can't make the Saturday market. There are only a few of these Saturday mornings left: the unstructured days when, if I wake before dawn to the deep rumbling purr of our 15-year old farm cat in my face, I can sleepily burrow him under the covers for a little more snoozing. Just two weeks from today, that warm spot on the bed will be all his well before 6 am, as we gather and load for market. It's a little crazy to know exactly what our plan is for every single Saturday from April 21 through the end of October. But it's true, whether we believe it or not, that the first early farmers markets and our spring memberships will be starting in just two short weeks. Of course, un-structured doesn't mean empty. I was soon enough out of bed and pondering how to juggle today's list crowded with unfinished tasks from earlier in the week. 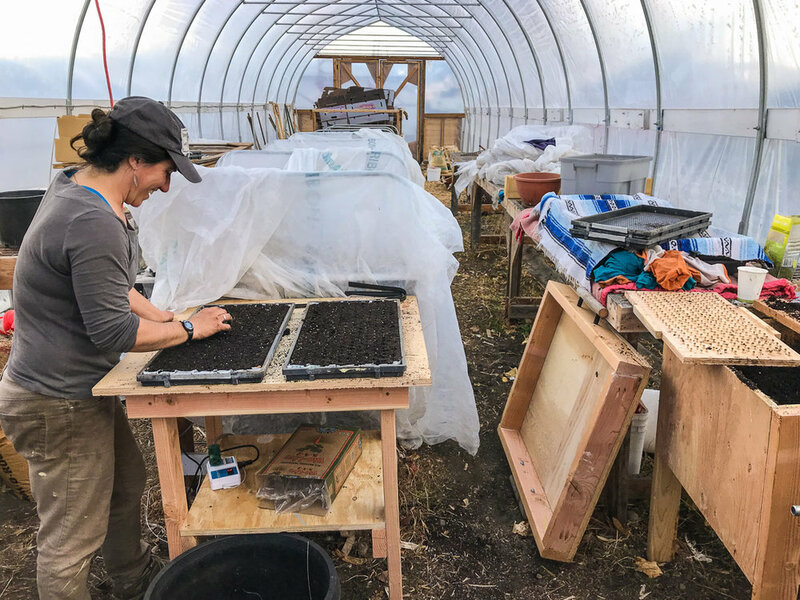 This time of year field tasks, greenhouse work, and building all jostle each other for the top slots on a list that grows even faster than the weeds. But we are excited to be out, feeling that sun and seeing some green growth, so we're each digging in to the list with some big hopes for the day. The baby greens in the high tunnels are starting to take off, with arugula so far appearing to win the good spring effort award. I have the urge to give them little pep talks about the markets coming up so soon, but I'll settle for getting them a good weeding, and beginning the ritual of daily on-and-off with the row cover, to keep them warm at night but maximize their light during the day. A part of spring, too, is the crazy calculus of how much we need to get started in our season. In these weeks before any markets or sales to our wholesale accounts, we rely on the membership signups as our only income stream. Looking over some of our orders this week, we could see so clearly what members do: 1.5 members covered the upgrades to drip irrigation that will save us hours per week and yield healthier tomato plants in our tunnels; another one member covers the biodegradable weed mat we are going to try for tomatoes and peppers. 2 more cover the huge roll of white row cover for keeping the insect pests off of the baby greens we'll soon plant to the field...the list goes on. Thank you so much to all of you who have signed up already, and to those who have helped with donations to our eatership fund. And the time to get your sign-ups in is growing tight! With the first pick-ups just two weeks out, we are closing sign-ups for the spring term on Monday. If you want to fill a feedbag April-early June, please sign up this weekend! Summer memberships will remain open, and we encourage you to reserve those soon as well. We are exctied to bring some member benefits beyond the weekly bag of veggies this year, so stay tuned for news of the first FARM-ily dinner potluck and farm tours, tentatively set for the first Tuesday or first Sunday of May. Early spring is the time of exciting abundance of seedlings and starts, but also the "hungry time" in terms of actual produce. It's a funny paradox, to be in the starting and growth and busy-ness stage of the farm, to be doing so much farming but not yet to have the piles of vegetables to eat. We've finished out even most of our kale and salsas from the freezer. The greens in the high tunnel are growing, albeit slowly, through the cool temperatures and the dark of snow and rain. We think they'll be ready for those April markets, but we've also been experimenting with micro-greens, a very fast seed-to-harvest crop, to quell our impatience, and be sure to have some fresh green crunch to offer farm members. Radish micgrogreens are now being stocked in the farmstore weekly, as we start to get the timing figured out with weekly plantings and harvests. If you haven't used the micros yet, now's a great time to give them a try. Sprinkle them as a garnish on top of eggs, soups, or salads; use them in place of sad store-bought lettuce in a sandwich, or make a micro-salad, with just a small handfull of the greens, a splash of oil and vinegar, and maybe a sprinkle of nuts goat cheese, or a ferment. We loved a dash of our local fermenter, House of Ferments' "Little Polish Girl" red sauerkraut on top of ours. RSVP for yurt-warming party next Saturday. Have you wondered what our biggest winter project is looking like, or what the heck a yurt actually is? Next Saturday, our final weekend before the markets, we will be having a yurt-warming gathering to thank supporters and those who helped us get a cozy home on the farm, through last year's kickstarter campaign. An invite will go out to all kickstarter donors, but if you have helped in any way in our process, and aren't sure you'll get the messages from kickstarter, please click here to RSVP so we can make sure you are included, and know how many to expect.